Here’s how to fix TaiG iOS 8.4/8.3 jailbreak errors like stuck at 20%, 60%, 1101, 1102 1103 etc which you might encounter during the jailbreak process on your iPhone, iPad or iPod touch. TaiG is currently available for Windows only and supports all iOS devices on iOS 8.4, 8.3, 8.2 and 8.1.3. Make sure Touch ID & Passcode is turned off Settings > Touch ID & Passcode. If you get this error, you will probably need to try using another USB port. If that too fails, try on a different Windows computer. An antivirus or firewall program is enabled on your program. Disable any such program and try jailbreak again. Once jailbreak succeeds, you can enable the program again. Make sure Find My iPhone is turned off. Settings > iCloud > Find My iPhone. Launch TaiG in Administrator mode – Right click on TaiG’s .exe file, click on ‘Run as administrator’. Now try to jailbreak again. It should work. If the above solution still fails to fix the problem, do a fresh restore of your device on iOS 8.3 and try again. You can download iOS 8.3 from here: Download iOS 8.3 Final For iPhone And iPad [Direct Links] and download iOS 8.4 from here: Download iOS 8.4 Final IPSW Links For iPhone And iPad. Turn off Wi-Fi on the device and try again. If you have Windows installed as VM in Parallels on OS X you may get error when installing iTunes 12.0.1. You can fix it by trying to reinstall Parallels Tools and then try to install iTunes 12.0.1 again. This affects Windows 64bit users only. Fix is posted here: Fix ‘Apple Driver Hasn’t Been Found’ Error On TaiG iOS 8.4/8.3 Jailbreak. Simply run Cydia and wait till it fully loads everything. This will fix the problem. 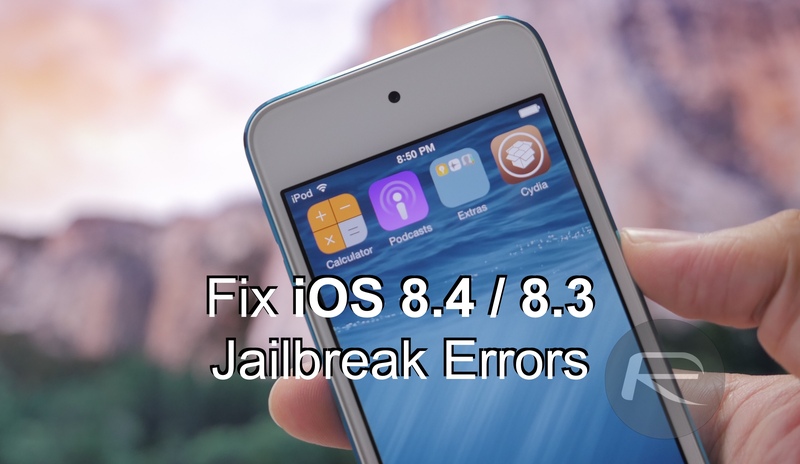 Detailed guide to fix this is posted here: TaiG iOS 8.3 Jailbreak: Fix App Store Updates, Settings Crash Issue. You can fix this by installing latest UIKit Tools version 1.1.10: Fix App Icons Disappearing Bug After iOS 8.3 Jailbreak, Here’s How. Having issues activating iMessage post TaiG jailbreak? Follow the instructions posted here to fix this problem. We’ll keep adding more TaiG related fixes here as we find them. If you know of any other fix that has solved your jailbreak issue, share with us in the comments below. Ty Mr. Doe, it worked for me. Are you on 32 bit or 64 bit windows? I still have the issue of it not finding my apple drivers. Using 12.2. on two computers. Both clean new installs, and Taig 2.3. Also how do you not setup wifi? How did you restore from backup? Was it a local iTunes backup? Is it possible to follow your method and restore from an iCloud backup? backup. The only way to initiate an iCloud backup restore – after having missed that during the initial setup – is to go to Settings -> Reset on the device and do a complete reset and erase. However, most jailbreakers know that on a jailbroken device, doing a reset via Settings -> Reset can cause a lot of trouble, like making the device unresponsive or stuck in a loop. I’m trying to jailbreak using Parallels on a Mac and I keep running into 1102. Running out of options. I might just try your method and wing the reset+restore from icloud. This worked for me! When I setup the phone I just linked apple account. After that I putted on airplane mode and jailbreaked. Then on itunes restored to my last backup(my phone backup) , syncronized and I still got my jailbrak ! Will the new TaiG 2.30 work on Itunes 2.0.1 because I have windows XP and I can’t get the latest itunes ? I have the same problem but will this work without the latest version of Itunes on my PC? I was getting the “Apple Driver Has Not Been Found” error. I followed the directions, installed the necessary driver, and was able to successfully jailbreak my iPhone 5c. However, now iTunes does not detect anything when I plug the phone into the computer. What should I do? Anyone? Thanks! I hope your mother dies in front of you, slowly and painfully, from cancer. Increasing the memory and CPU cores to 2GB and 2CPUs is the only thing that fix repeated 1102, 1103, and 1104 on virtual machine install of windows. I suggest adding this solution to the article, since this immediately fixed the issue for me after hours of restoring and retrying. First try after upping memory and CPU worked. you need to turn on touch id in settings. Jailbreak process keeps getting stuck at 40% but the error code is -1103? What do i do? I’m trying to jailbreak a 5s with iOS 8.4. I’ve followed this guide, and tried every version of TaiG in this article, and it still fails at 20%, code 1101.
itunes 12.2.1 + taig 2.4.1 worked. yes worked.you should have itunes opened while program is running all will be fine than. i just got error -1100. anyone help? Just turn off wifi, passcode and touch ID. Then turn on AirPlane mode before proceeding. These solve more than half the problems. Thank you redmondpie for these great fixes. My Ipad Air was jailbroken on a ios 8.1.3. Unfortunally I updated it to ios 8.4 over itunes. When I try to jailbreak it with taig tool, “device already jailbroken” messages pops up, I try to re-jaibreak, it install sucessfully but the ipad get stuck at apple logo, what should I do ? after i jailbreak something terrible happend, i cant connect my ipad to itunes, how should i do? I tried jailbreaking on my Mac and keep getting error code 1007. My iPhone is activated though. Can it be because I downgraded from 8.4.1 to 8.4? I also tried putting it in airplane mode and still get the same thing. There is a denial of access for a lot of cheap ՍΝᏞΟᏟΚings in to the AT&T data base, that makes all of the 3rd party ՍΝᏞΟᏟΚing sites incapable of սոⅼοсking AT&T anymore. However, you will find still sites that can do the job, just google atttiphooneuunlockingis one of us, go look it up, oahu is the site I have now been using for 6 of my phones following the database shut down. it says please restore before jailbreak…recover to ios 8.2.. what should i do?